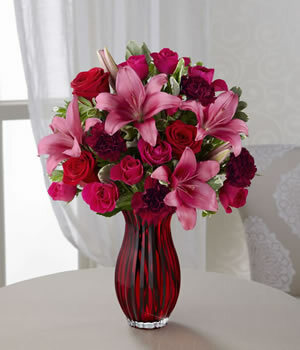 Lasting Romance Bouquet beautifully reflects all your love and affection with classic Valentine's Day grandeur. Rich red roses, eye-catching dark pink LA Hybrid Lilies, hot pink spray roses, and burgundy carnations are accented with lush, fragrant greens in an heirloom quality vase of sparkling red glass. It makes a uniquely elegant way to express what's in your heart, this coming February 14th.